While the Republican presidential candidates were on stage in Cleveland, several Washington clubs took on the air of sports bars at debate-watch parties scattered across the city. Roll Call did the bar crawl and hit those at the National Press Club, the Union Pub and Johnny Pistola&apos;s.
At a watch party at the National Press Club, a small crowd gathered as the earlier debate between the candidates who didn't make the prime-time stage was wrapping up. People shared appetizers and cocktails and discussed the second-tier candidates. J.M. Peterson, a Virginia-based photographer and writer on homeland security, said he has narrowed down his slate. "Everyone seemed ready. They had their ducks in a row," Peterson said. "I thought Lindsey Graham was on his game. They didn't really go after each other – they went after Hillary." The vote market: "I'm voting for Bernie, but my money is on Hillary," said one Democrat at the PredictIt party at Union Pub. And that pretty much sums up the thinking behind prediction markets -- that they are more accurate because they are based on who people think will win, not who they want to win. PredictIt officials noted the stock in Carly Fiorina, who many political observers agreed performed strongly in the early debate, went up before the first debate even started. Another bettor, a Democratic hedge-fund manager who said he had met Donald Trump several times and is a self-avowed political junkie, said he had invested in PredictIt but was mainly at the party for the spectacle, which he compared to a Muhammad Ali fight. "People would tune in to see whether he got knocked out, or they loved him and they watched to see him prevail. ... There was nothing in the middle." And that's why he said he was there Thursday -- to see a "brawl." Instant analysis: "Oohs" went up from a crowd of journalists, communicators and their guests at the Press Club when Trump was the only candidate to raise his hand that he would consider a third-party run if did not win the GOP primary. "This is so scary that this is how it's happening. ... This is like reality TV," said one wide-eyed observer. He was concerned with how the rest of the world perceived the debate. "Do they understand that this is a joke?" he asked. On second thought: "Ben Carson is going to be the Carly Fiorina of 9 p.m.," one Republican Hill staffer predicted around 8 p.m. at the PredictIt watch party. An hour and a half later, the staffer, who works for the House Natural Resources Committee, had changed her tune. "I take it back," she said of her earlier assessment. Given that energy -- her pet issue -- had barely come up, she thought Trump was doing the best based on the reactions of the people around her. "But I truly believe," she added, "Rand Paul is holding his own." Enjoying the show: One particularly enthused spectator who pumped his fist in the air after many candidates' remarks said he always attends watch parties like the one at Union Pub as an undecided voter. "Trump is winning by a mile," he said. "But that has nothing to do with the substance of his argument." Instead, he said, it's the way people "viscerally" respond to him that explains his success. "He's making a fool of everyone else. ... He looks like a man among boys up there." But that doesn't mean he liked what he heard. "I wouldn't vote for him based on what I heard tonight." But at the end of the day, he added, these are just sales pitches. "You cannot win an election tonight, but you certainly can lose it." 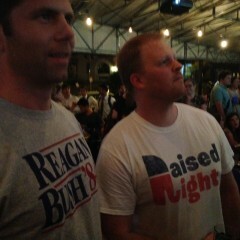 Call and response: At Union Pub, there were chants of "USA! USA!" when Trump was introduced and again when he talked about running as the Republican nominee. "Boring!" someone yelled as Ohio Gov. John R. Kasich talked about economic policy. A Republican Obama? : Sporting pale blue T-shirts emblazoned with "Bernie" on the front and "join the political revolution" on the back, two supporters of Sen. Bernard Sanders occupied a couple of sought-out seats with a clear view of the five TVs at Union pub's outdoor bar. "I'm supporting Bernie," said a political fundraiser who could not disclose his employer, "because he actually cares about people." 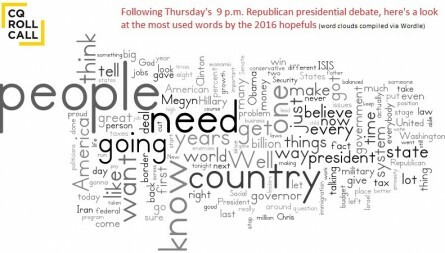 "And I like his ideas more than hers," he added, referring to predicted Democratic nominee Hillary Rodham Clinton. "But she had good ideas, too." "He wants to get people into politics and get money out of politics," added a Sanders volunteer. Both Sanders supporters agreed Sen. Marco Rubio was performing the best about midway through the debate. "He sounds presidential," said the fundraiser -- like "a Republican Obama." But will Rubio have the money to move above the middle of the pack? "As long as Sheldon Adelson keeps giving him money he'll be fine." For real? : As more drinks were consumed, people are reacting a little louder at this wood-paneled Press Club. A couple was leaning on the bar, rubbing each other's back lovingly to the debate. The real Trump: "I feel like Chris Christie is killing it," one House Republican staffer at the Press Club observed during the debate, pointing to the New Jersey governor’s answer on entitlement reform. "Marco Rubio has hit his points. He's said what he needed to say. People will respond to that," said Parker Briden, a young conservative who attended Thursday's debate at the Press Club. "People are seeing the real Trump tonight, showing his ego,” Briden added. “I have a hard time believing anyone is going to respond to a whole tirade about how successful his hotel was in Atlantic City. They wanted policy." Too many candidates: One man at the GOP party at Johnny Pistola's who said he works in commercial real estate said he's supporting Rubio because "he has framed the issue of American exceptionalism better than any other candidate ... it mostly had to do with his personal story," which "speaks to everything the Republican Party should want." "Rubio did the best," said one member of the Arlington Republicans who was looking a little lost after the televisions switched to Jon Stewart’s final “Daily Show,” finding his compatriots had dwindled. "But there are too many candidates," he added, "So I'm not sure it really made much of a difference." Popular populist: A government major at Skidmore who's in D.C. for the summer didn't have to say who he was supporting. 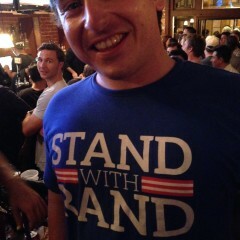 He was one of the few young people upstairs at Johnny Pistola's whose shirt gave him away. America is mostly purple, he said, and Rand Paul is the only "populist" candidate. "A candidate like Rand Paul is going to stand out," said the longtime supporter of both Pauls, both father and son. Standing amid a small Rand Paul posse, the Skidmore student (and his shirt) were sought after by TV cameras illuminating the crowd. 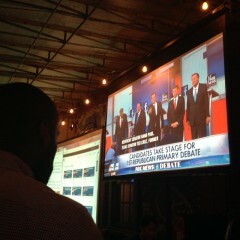 A net positive: Overall the crowd at Johnny Pistola's was very young and very Republican. A Jeb! sticker on the breast pocket of a tipsy gentleman sporting American flag pants stood out because, with the exception of the Paul supporter, there weren't a lot of visible allegiances. A member of the D.C. Young Republicans who is the director of development for a Washington think tank said that several candidates did well. First among them was Rubio. Overall though, he thinks "Trump is a net positive" because he helps the others "speak to issues they're not eager to." And he thought Trump "effectively" handled Fox News’ Megyn Kelly's attempt to "trap" him into saying he didn't respect women. Bush, he mentioned as an afterthought, "rambled." But this young Republican's companion, an older, more tipsy independent, thought Trump underperformed while Bush did a good job because he "maintained his stability" within the pack.